The Silent Hills playable teaser, known colloquially to gamers as PT, was originally released in 2014 as a PS4 freebie on the PlayStation Store. But after the apparent breakdown in relationship with Hideo Kojima the wheels came off Silent Hills, Konami pulled it, and blocked anyone who already had it from re-downloading it. 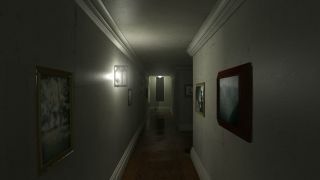 Fortunately for those who missed out on the experience, it's now possible to play a small part of it on the PC thanks to the efforts of Farhan Qureshi, an aspiring game developer who put together an accurate and extremely detailed recreation of the PT hallway in Unity. "I started this project for a 3D modelling workshop I’m planning to teach in September," he explained on The-Outline.com. "Originally I wanted to create an apartment scene for its simplicity, variety, and familiarity, but I wanted something more game-focused as the workshop is being targetted at the Calgary Game Developers. I ended up choosing the PT hallway as it’s an interior scene fairly close to an apartment, and the simplicity, variety, and familiarity still exist. Plus it’s no longer available to download, but I can make it live on in some fashion by doing this." Despite being just a small piece of PT, creating the hallway was a major undertaking, although one he clearly enjoyed. "104 hours over 4 weeks. 5 hours of sleep on half those days. 8-hour obsession-infused modelling sessions. Thinking of what I wanted to implement while dishwashing at my job," he wrote. "This was a blast." PuniTy—that's what he calls it—is available for 32 and 64-bit Windows, as well as Mac and Linux. Grab it from Dropbox or, if that's a bust (as you might imagine, it's getting hit pretty hard right now) from Itch. And take heart: PT may be gone, but it sounds like the collaboration between creators Guillermo del Toro and Hideo Kojima will live on. "I love working with Kojima-san," del Toro said last week. " We are still in touch. We are still friends and working into doing something together, but that’s not going to be [Silent Hills]."